Exercises for basketball players should be designed to improve the skills needed specifically for the sport. Basketball is tough. It requires players to run, jump, slide, backpedal and even dive to make a play. The sport's requirements are so extensive that setting up an exercise program for basketball players actually gives you a lot of freedom to incorporate a number of different types of exercise. To develop well-rounded players, you'll need to plan well-rounded exercise routines. Include each of these types of exercises for basketball players into your workout plan each week. If you've ever watched a game of basketball, you probably realize there's a lot of running involved in the sport. Not only do athletes have to sprint back and forth across the court, they have to maintain enough endurance conditioning to be able to play the entire game. 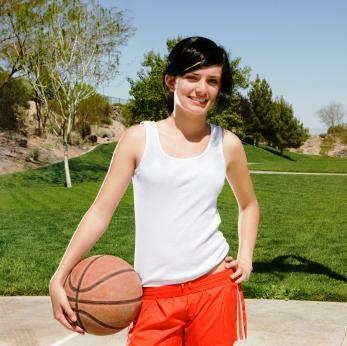 Incorporating interval endurance exercise into a basketball player's routine will prepare her for the game. One way to do this is to have the players jog around the court 20 to 30 times, sprinting the length of the court, then jogging the width. When there's a fast break situation taking place, your players need to be able to sprint down the court as fast as they can. Speed training will prepare them for these situations. You can have them run "horses" for time, or you can plan drills that mimic real-life fast breaks. For instance, you could start two offensive players at half-court, and a defensive player behind them at the free throw line. When you say "go," the offensive players begin running toward the opposite basket and the defensive player has to try to catch up to the offensive players, sprinting as fast as she can to stop the easy bucket. Basketball players have to jump in order to rebound, shoot and intercept a poorly thrown pass. The faster and higher your players can jump, the better they'll be able to play. Incorporate plyometric jumping exercises into your practices to help them improve their skills. You can add real-life drills into your practices, like rebounding drills where the players practice jumping off both feet to retrieve the ball, or you can set up cone stations, where players jump back and forth over cones to improve their jumping speed. In addition to lower body plyometric training, you can also perform upper body plyometric training. Like lower body training, upper body plyometric exercises will help improve the strength and power of your player's arms, chest and back. You can add upper body plyometric exercises by incorporating medicine ball throws into your practice or performing "up/down" exercises that require the players to explosively move from a pushup position to a standing or jumping position. Basketball players slide, backpedal and change direction on a dime. You want to prepare your players to perform these motions in a coordinated fashion. At the start of every practice, incorporate a series of warm-ups that involve bounding, sliding, backpedaling, skipping and sprinting back and forth across the court. Then, add game-like exercises like crossover dribbles, defensive slides and going for a loose ball. You want your players to remain strong throughout the season. Strength training will help players hold their ground when fighting for position under the basket. Incorporate at least eight to 10 strength training exercises with your athletes two to three times a week. When possible, avoid performing strength training exercises the day before or the day of a game. When you plan the workout, be sure to incorporate compound movements that target multiple muscle groups like squats, lunges, pushups, pull-ups and deadlifts. Round out the routine with abdominal work and isolation exercises like planks, hamstring curls and shoulder presses. It may seem like there are too many different types of exercises to be able to plan a well-balanced routine. Luckily, most of the exercises for basketball players can be easily incorporated into a normal basketball practice. If you practice five days a week, plan on incorporating strength training for 20 minutes, two or three days a week, then spend the rest of your practice time alternating between exercises and drills designed to enhance the other elements of a basketball players' skills.